When even good singers are not properly supporting their voices, all kinds of other things happen that work against effortless singing. Have you ever watched an otherwise excellent athlete try to swim, when he doesn’t know correct form? He can get across the pool, but he’s completely winded after two laps, and he might even have pulled something. When the voice is not supported and the breath controlled, all bets are off. The tongue which needs to remain in a relaxed concave position, sitting on the bottom of the mouth, tip of the tongue resting behind the teeth (for classical singers, some rest the tongue on the edge of the teeth), may begin to spasm or contort, or even pull back in to the mouth, cutting off frequencies and creating unwanted tones (why do I sound so nasal on the high notes?) The jaw may compensate for the lack of support, and tense up. 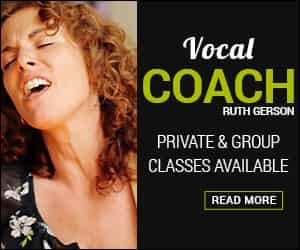 The singer may try to hold the air in the proper place in the mouth by jutting the jaw out, but this also pushes the tongue up, and the singer then has to compensate and push through the tongue, straining the voice. The singer never wants to push. If the support is down low in the body, the jaw can release, and the tongue can relax and the air can be placed and balanced easily in the mouth. Just like with the swimmer, when the body isn’t rocking from side to side, it takes a lot less effort from the arms and legs to get across the pool. It’s a smoother ride, he maintains his energy and can have endurance. 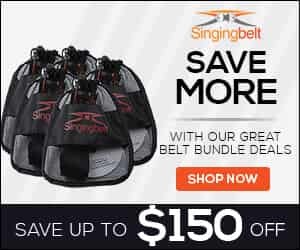 With the Singingbelt the singer is learning to support the voice, so the rest of the body can get in the right position and for great singing! The Singingbelt DVD & CD also give instruction and vocal exercises that address tongue and jaw position and relaxation.